I've wheeled and driven both and can safely say I am always going to be partial to anything 1986 and older. Newer Wranglers are just too refined and soft for me, and although a Rubicon is a very capable 4x4, I feel out of my element driving one. No metal dashboard, no round gauges, no airbags, no rough and tumble solid interior that can be washed with your garden hose, and most importantly, no simplicity in repair. Plus you flat out just don't see many CJs anymore, and when you see one it's a rare occasion. But every time you turn around you're looking at a Wrangler. A CJ has a story to tell always, and you can usually read it judging by the condition it is in, how much trail damage it has, what kind of lift and tires it has and so on. CJs are easy to work on, and any shade tree mechanic can do any repair on one. With a newer Wrangler, you have to take it to the dealership or a qualified mechanic. And lastly, whenever you go to a Jeep gathering what Jeep do all the other Jeepers come flocking to see? The CJ. Larry's Comment: Hey Jon...I have to agree that the newer a Jeep (or any vehicle) is makes it that much more difficult for the average home mechanic to work on effectively. For that matter I have known fully trained and certified mechanics who have difficulty diagnosing problems on newer vehicles...often leaving customers in the lurch. The Jeep CJs and early Wranglers can still be worked on by most "shade tree" mechanics, but it is getting harder and harder to fix anything much newer than a 1999 model...at least from my experience. I'm not taking anything away from the new Jeeps. They are fine vehicles, if not a little too plush for my liking, however, when something mechanical goes wrong it seems to require someone with a degree from MIT to diagnose and fix the darned things. 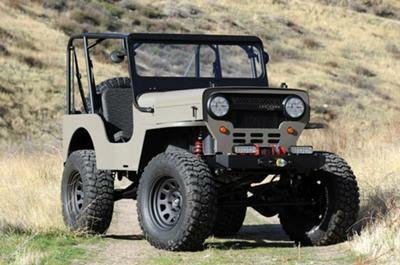 I have written several articles pleading with the Jeep designers to at least offer an old school, simple model reminiscent of the CJ, that would be easy to work on and maintain. I am also keenly aware that a lot of the automotive world is being manipulated and controlled by excessive government regulation and unnecessary requirements, but instead of standing up to these political bully tactics the vehicle designers and engineers capitulate with more and more "technology" and less and less practicality. Jon...if your CJ also has a story please send some photos and tell us more about your Jeep. Thanks! I agree Jon, the older Jeep CJs are rapidly disappearing form most citys, towns and countrysides. When I found an '85 CJ7 with a blown engine and no tires, the body was quite rotten already, I had to have it. I spent six years on a slow, but well planned rebuild, and now I proudly drive it most places I go. I built it with the original looks in mind, with only the 383 stroker, 4" lift and 35" mudders giving the cool and capable look. There are lots of other hidden goodies that make it a very capable off road machine. Join in and write your own page! It's easy to do. How? Simply click here to return to Old Jeeps Versus Newer Jeeps!.